Preheat oven to 200ºC, gas mark 6. Heat the oil in a frying pan, add the onions and cook for 2 minutes, then add the garlic and 50ml water and simmer for 3–4 minutes until soft. Place the onion mixture into a roasting tin with the tomatoes and courgettes, and then scatter with the basil leaves. Add the chicken thighs and turn to coat in the tomato mixture. 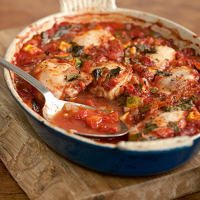 Bake for 40–45 minutes, until the chicken is thoroughly cooked through and the juices run clear. Serve with steamed essential Waitrose Easy Cook Long Grain Rice, or boiled new potatoes.